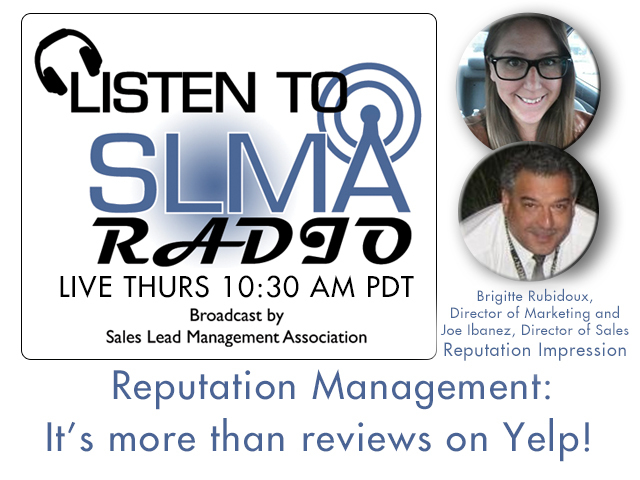 Reputation Management: It's more than reviews on Yelp! ~ What is reputation management? ~ How do we control or respond to negative reviews? ~ How can we prevent negative reviews - or at least cut them WAY back? ~ Who is most likely to review your business and sully your reputation? ~ Who can help you BUILD it up? This is geared toward service industries including auto, home services, hospitality, medical, legal and wellness. Many business owners think that simply responding to reviews you receive on Yelp! is enough. It goes way beyond that. There are several venues that collect reviews, plus atypical places. *ASK YOUR QUESTIONS* in the event stream in case you can't make it. Please reply YES or MAYBE so you stay current on this discussion and don't miss the live event! Brigitte Rubidoux is the Director of Marketing at Reputation Impression, creating & managing all aspects of the company's digital brand. After attending the University of California Santa Cruz, she returned to San Diego to pursue a career in marketing. Brigitte is one of the early employees of the company and with her get it done attitude, has moved up from executive assistant to the Director of Marketing. She is always looking forward, trying to stay up to date with best practices and new ideas related to Internet Marketing. As the Director of Sales for Reputation Impression, Joe has been able to utilize his Sales Training and his Personal Coaching skills learned while under the employment of Anthony Robbins and SBC Communications (now AT&T) to help Reputation Impression improve its Sales and Skill sets of employees under his direct supervision. Joe's skills are mainly focused towards Customer Service and satisfaction while having a proven track record in the sales arena as well. This will be a live event on YouTube LIVE, Wednesday, September 10 9am Pacific.